At the World Economic Forum in Davos, Switzerland, an exclusive group of scientists, researchers and experts discussed the ill-effects and threats posed by autonomous weapons, or “killers robots” and scrutinised the need for the world to get rid of them. The panel in Davos included former German UN High Consultant for Disarmament Affairs Angela Kane, BAE Systems Chair Sir Roger Carr, as well as experts from the fields of Artificial Intelligence and Robot Ethics. Angela suggested that the world has not been quick and careful enough to safeguard mankind from such technology. She pointed fingers at “several reps within the worldwide group” who do not feel concerned about this pressing issue and as a result, this movement has been highly “restricted”. Sir Carr described a $40 billion industry working on autonomous weapons in 40 countries. In his opinion, fully independent weapons would be “devoid of responsibility” and would have “no emotion or sense of mercy”. These concerns are not new. The world has previously seen elaborate attempts to neutralise rapid developments in this arena. In May 2014, United Nations Human Rights investigator and Special Rapporteur on executions Christof Heyns called on for states to declare a moratorium to prevent killer robots being deployed in the battlefield. He also signalled that unmanned robotic weapons with varying degrees of autonomy and deadliness were being tested by United States, Britain and Israel without debate on moral and legal issues. In 2015, killer robots were discussed in an informal meeting during the UN Convention on Certain Conventional Weapons (CCW) and relevant concerns were raised. The Campaign to Stop Killer Robots, a group of non-governmental organisations who seek to pre-emptively ban lethal autonomous weapons, continue to draw global attention even today. 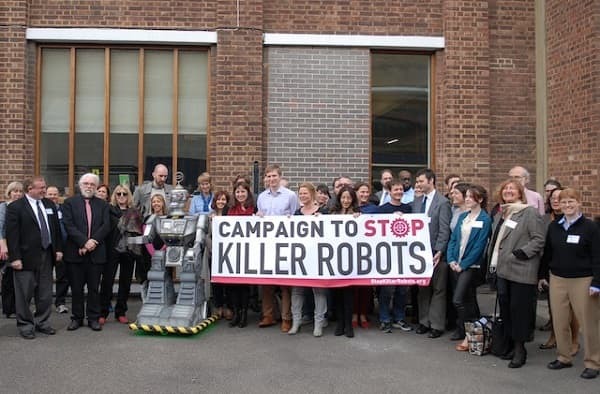 First launched in April 2013, members of this campaign have urged governments and the UN to issue policy to outlaw the development of “lethal autonomous weapons systems” or LAWS. It is a matter of deep concern that countries like the United Kingdom have opposed such campaigns and dismissed their demands. At the 24th International Joint Conference on Artificial Intelligence (IJCAI-15) held at Buenos Aires last year, over 1000 experts in AI, including Stephen Hawking, Elon Musk, Steve Wozniak, Skype co-founder Jaan Tallinn and Google DeepMind co-founder Demis Hassabis, co-signed a letter warning of the threat of an arms race in military AI and calling for a ban on autonomous weapons. This movement is an effort to suppress the ambitious aspirations of nation states, aspirations that are dangerous more often than not. Certainly here, there is a long way to go.